Low clouds boil over the mountain top like rolling fog. Whites and greys contrasts with deep black of ashen, skeletal trees. Burnt and broken logs lay in every direction. 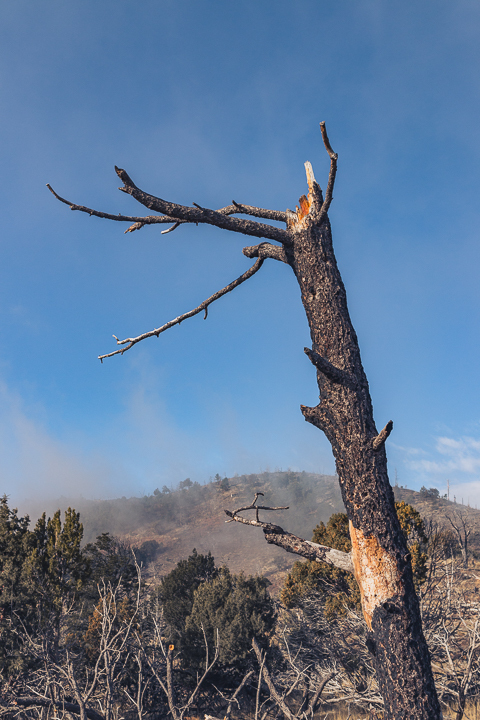 The landscape is a stark reminder of devastating fires. These are deep scars. But look closer. Occasional bursts of green sway in the cool breeze. The sun shines in a blue sky above these earthbound clouds. Birds sing. Deer graze. There is life. This is one small corner scorched by a wildfire that burned over 44,000 acres. It took over three weeks to contain the blaze. Some 254 structures were taken in flames. The cabin in which I stay, some hundred feet away, was saved by the serendipitous placement of the road leading to it. The fire could have, perhaps should have, jumped the obstacle. But there it stands, as good as new, untouched by smoke and flame. We are surrounded by people who are burnt and broken. Some appear to have been saved by chance. Many of their scars are hidden behind green growth that followed their own, very personal fires. The wounds suffered may not have been as grievous as yours, but they still ache. The memories and bruises remain, coloring their world view. They are made both weaker and stronger by them. No doubt, you are burnt and broken to some extent, too. You will still be burnt and broken tomorrow. Still, so long as you breathe, there is hope. The devastation you suffer can bring about something more beautiful than any of us could possibly imagine. That which we survive allows us to build something greater. I tend to be slow to connect with people. A recent realization makes me wonder if it is something beyond being introverted. I bury scars so deep that I only see them when illuminated by the pain of others. My personal tragedy is stored in the dark recesses of my brain, hidden from consciousness. The last few days have been distracted by this introspection. Is this what drives my social awkwardness? I have, overall, lived a good life. Certainly better than I deserve. So what am I burying and why? And then it clicks. Connecting with someone new increases the likelihood of opening old wounds. Perhaps they need to be opened.